There is a tradition or superstition of saying “Rabbit, Rabbit, Rabbit” first thing each month… for good luck and so I try to via ColumbusBestBlog.com. It’s easier in the spring to come up with things that tie in with rabbit’s March Hare, the Easter Bunny… but it get’s tougher later in the year. September 2009 In August I saw lots of rabbits, thanks to Connector Radio and the Ohio State Fair. I won tickets listening to Connector Radio the evening the Ohio State Fair was on. I shared the first of those photos September 1, 2009. August 2009 Little did I know in July that I would see so many bunnies in so little time. 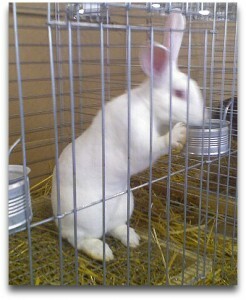 In August I was haunted by an itty bitty bunny I took to a wildlife rescue in July 2009.